You're going out with friends mid-week, and you don't want the boss/significant other/parole officer to find out. But it's a birthday celebration, and Facebook's auto-tagging the pictures your buddies upload like a dirty snitch. The first piece of advice: never "friend" your parole officer. The second? 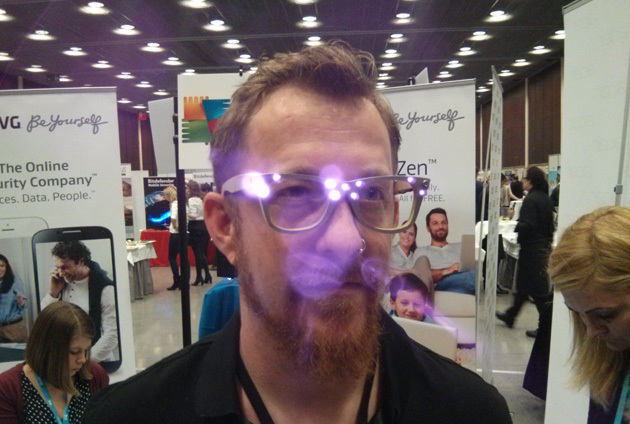 Maybe grab a pair of these "privacy" glasses from software security firm AVG. You, of course, can see my visage above, but AVG claims the technology in the specs means facial recognition software (like that of Facebook) will not. How does it work? There are a couple of things going on here, but essentially AVG is using infrared LEDs to mess with the filter most cameras use when taking pictures. By futzing the light around your eyes and nose, there's enough damage to the image to prevent facial recognition from figuring out who you are. There's a reflective covering, too, that lights up when a flash is used for similar results. This is very much a prototype, and our test shots with an iPhone, Nexus and a DSLR all yielded different results -- as you can see in the images above and below. AVG told us it's only experimenting with the idea right now. Dare I say it, they are having a bit of thought-provoking fun? This is all to say it probably won't become a product any time soon, so if you really are on parole, you're not out of luck. You just need to consider your options.